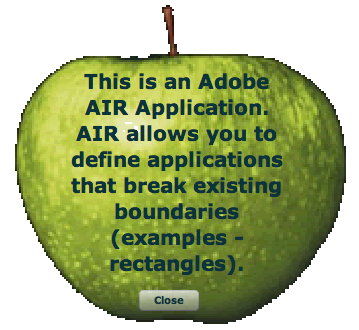 How I feel about Adobe AIR with a Flying Vee! Gearbox also reports the same but I am skeptical having not seen either Apple nor Adobe issue any statement. The rumor buzzmill is running at half capacity. Once again, we have to wait and see if there is any truth behind it. I have decided to move many of my Flex and AIR recipes from the Flex Cookbook to the official Adobe Flex cookbook site. The first two are posted there now. If there is interest (comments, users) I'll post the rest over the next few weeks. You may also request the cookbook as a standalone document commented with instructions by emailing dnickull at adobe dot com. 1. Building an Apple shaped, chrome-less application as per the photo below. This application has been updated from previous versions to be compatible with the latest build of Adobe Flex Builder 3, beta 3. 2. Simple Demonstration of Binding to a Camera using flash.media.Camera. 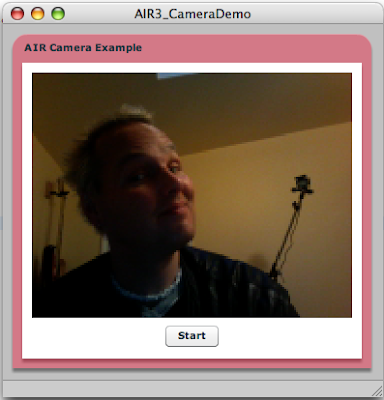 This sample is all about quickly binding to a camera stream and displaying the video image on your application using an object. Screenshot below. Ben Forta sent me this link. The use of Flash is really cool. The new Yahoo! Maps API is now entirely built in ActionScript 3.0. The Maps API now gives you an incredibly powerful map engine and the ability to create custom components, overlays and markers while consuming different webservices provided by Yahoo!, or your own. Flash/Flex your heart out!